It's hard to believe that Jonestown ever existed. The patch of rainforest in remote northern Guyana where Jim Jones moved his People's Temple in the 1970s has been almost entirely reclaimed by the jungle. Locals say if you search long enough, you can still find remnants of a tractor used for transport and agriculture and a filing cabinet that would have kept documents about the community. The metal drums in which Jones mixed cyanide and fruit punch in preparation for the mass murder-suicide which took place at the site 33 years ago are also still in place. "We should make sure it's not forgotten by the young people. They should know what can happen," says 80-year-old Wilfred Jupiter, a labourer who helped clear the land and build Jonestown in the 1970s. Guyana is still the undeveloped backwater that first attracted the self-appointed Reverend Jim Jones. A former British colonial outpost in South America, its tropical location has done little for its tourist industry. It lacks the turquoise waters and white sandy beaches of nearby Caribbean islands. But some Guyanese would like to see the notoriety it gained through its connection with Jones converted into tourist dollars. Carlton Daniels is the former postmaster in Port Kaituma, a scrappy mining town close to the old Jonestown compound. He's one of the few residents who remembers what happened there. "Bringing in some tourist dollars could be good for development. There's a lot of gold mining right now, but minerals don't last for ever," he says. Guyana unwittingly became the focus of media attention when Jones leased land there in 1974 to set up a branch of his People's Temple. In Jones' native United States, the cult had garnered criticism; some members had defected. English-speaking and largely undeveloped, Guyana offered a place for Jones to set up a commune away from prying eyes. Cult members built a school, a pavilion and cottages, growing what food they could in the tropical heat. But the critics' worst fears were realised on 18 November 1978. After escaped cult members complained that the organisation was being run like a prison camp, US Congressman Leo Ryan visited Jonestown to try to help some residents to leave. As they got ready to board a plane at a nearby airstrip, some of Jones' security guards opened fire. Ryan was killed, along with four others. "It was the most horrific scene, and it hasn't left me yet," says Gerry Gouveia. As a young pilot in the military, he was one of the first on the scene. "The priority was to evacuate the wounded from the airstrip and then we went back for the bodies, but we still had no idea about what was happening in Jonestown itself." After the shootings at the airstrip, Jones had gathered the remaining residents of the People's Temple and made them drink punch laced with cyanide. Many "drank the Kool-Aid" but others were shot or had their throats cut. Jones himself was found shot dead. A total of 918 people died, all of them US citizens. The compound was reclaimed by the jungle while Guyana dropped out of the headlines. Now, some Guyanese would like to see Jonestown redeveloped as a way of bringing much-needed income to the local area and putting this forgotten country on the tourism map. "What we need to do is attract people to come to Guyana, whether that attraction is Jonestown or Kaieteur Falls or birding or ecotourism or cricket, to see what a wonderful country Guyana has turned out to be," says Mr Gouveia, who now runs his own airline and tour company. 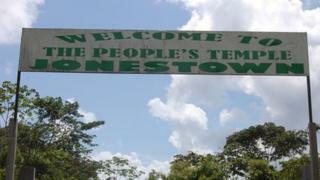 The country erected a plaque at the site two years ago that reads "In Memory of the Victims of the Jonestown Tragedy". Events are sometimes held on 18 November to commemorate the tragedy, although this year the anniversary is overshadowed by upcoming presidential elections. But the authorities in Guyana acknowledge that much more could be done. "It's possible to recreate something to give people a walk-through experience, to show the videos and literature, to put up a museum of Jonestown," says Indranauth Haralsingh, director of the Guyanese tourism authority. "There could be targeted marketing first to the US and then elsewhere." Other nations have shown that it's possible to commemorate atrocities with compassion and provide the opportunity for tourists to reflect on past events. At the former concentration camp at Auschwitz, visitors can tread the same path as those who were about to enter the gas chambers. In Kigali, a memorial centre remembers the Rwandan genocide, a tragedy less than 20 years old.